Need a gift but don't know exactly what to get? 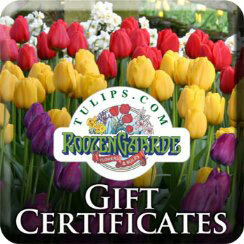 You can't go wrong with a Tulips.com Gift Certificate! Our Gift Certificates have no expiration date and can be used online at Tulips.com, via phone, mail order or in person at our gift shop (RoozenGaarde).